The fourth preliminary session from the Youth Olympic Games will be relatively light with only four individual events in the men’s 50 fly, women’s 50 back, men’s 200 breast and women’s 200 free. It will also feature relay prelims in the men’s 400 medley. Among the highlights will be last night’s 100 fly winner Andrei Minakov taking on Kristof Milak in the final heat of the men’s 50 fly, while we’ll also see two others winners from last night in Barbora Seemanova (100 free) and Ajna Kesely (800 free) swimming in the women’s 200 free. Fresh off a new Russian Record last night in the 100 fly, Andrei Minakov topped the men’s 50 fly prelims this morning in 23.50, improving his previous best of 23.53 done at the 2017 World Juniors where he won silver. Minakov also won the European Juniors this past summer in 23.56. 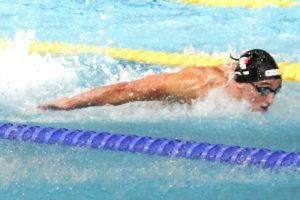 Kristof Milak took 2nd to Minakov in the final heat, and was the only other swimmer sub-24 in 23.99 for the #2 seed. Milak holds a best of 23.72, also done at those World Juniors, where he took bronze behind Michael Andrew and Minakov. 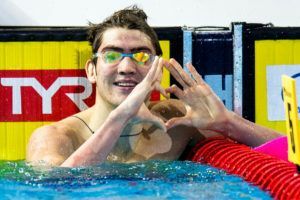 Russia’s Daniil Markov won a quick heat 6 in 24.00, with Shen Jiahao, Thomas Ceccon and Tomoe Hvas following him with the next three fastest times in the field, and Luca Nik Armbruster of Germany won heat 5 for the 8th seed in 24.30. Kaylee McKeown won heat 4 and takes the top seed into the women’s 50 back semis by a wide margin in 28.17, missing her best time from 2016 by just .07. American Rhyan White (28.46) and Canadian Madison Broad (28.95) also went sub-29 in that heat to advance t-2nd and 5th overall. 100 back gold medalist Daria Vaskina won heat 5 and tied White for that 2nd seed, followed by Tamara Frias Molina of Spain in 28.89. Latvian Arina Baikova won the other circle-seeded heat in 29.25 for the 7th seed, lowering her PB by a tenth. She now sits just two-tenths outside of their national record. Five of the top-6 times in the men’s 200 breast came out of the last heat, led by Japan’s Yu Hanaguruma in 2:13.58. Savvas Thomoglou of Greece eclipsed his personal best by .01 for 2nd in 2:14.94, and Thanh Bao Pham of Vietnam missed the Vietnamese National Record by mere hundredths in 3rd (2:15.29). Caspar Corbeau of the Netherlands, the European junior bronze medalist, won heat 3 to take 4th overall in 2:15.38, and Matija Moze of Slovenia advanced in 7th overall (2:16.28) after taking heat 2. Hungarian Ajna Kesely was the lone women sub-2:00 in the 200 free heats, clocking 1:59.52 to take the top spot into the final. 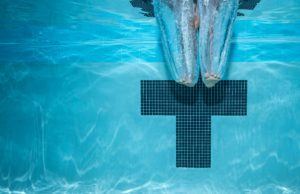 Kesely, who won the 800 free last night, was the silver medalist in this event at both the 2017 World Juniors and the 2018 Euro Juniors, holding a best of 1:57.10. 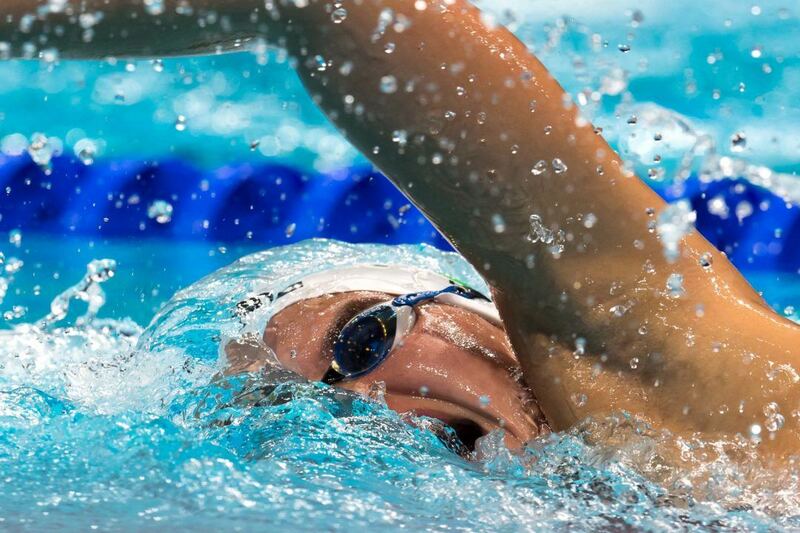 German Julia Mrozinski improved her best by a quarter of a second for the #2 seed in 2:00.00, and last night’s 100 free silver and gold medalists Yang Junxuan and Barbora Seemanova had another battle in heat 5 with Yang out-touching the Czech by .01 as they advance in 3rd and 4th. Brazilian Rafaela Raurich was the only swimmer to advance from heat 3 in 2:00.73 for 5th. The Polish team of Jakub Kraska (56.62), Jan Kalusowski (1:03.71), Jakub Majerski (52.64) and Bartlomiej Koziejko (52.34) won a close race in heat 1 of the men’s 400 medley relay, touching in 3:45.31 over Japan (3:45.34) and Hungary (3:45.41). Japan’s team included a 1:01.66 breast leg from Yu Hanaguruma and a 52.41 fly split from Shinnosuke Ishikawa, while Kristof Milak was 52.58 on the Hungarian fly leg. The Russians then put up a 3:43.50 from heat 2 for the #1 seed, led by a 53.62 backstroke lead-off from Kliment Kolesnikov, and the Chinese team was next up in 3:45.74 which slotted them in for 5th. 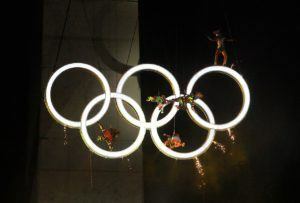 With a pair of no shows from Brazil and Australia, the U.S. team (3:47.91) was the only one not to advance out of the heats.